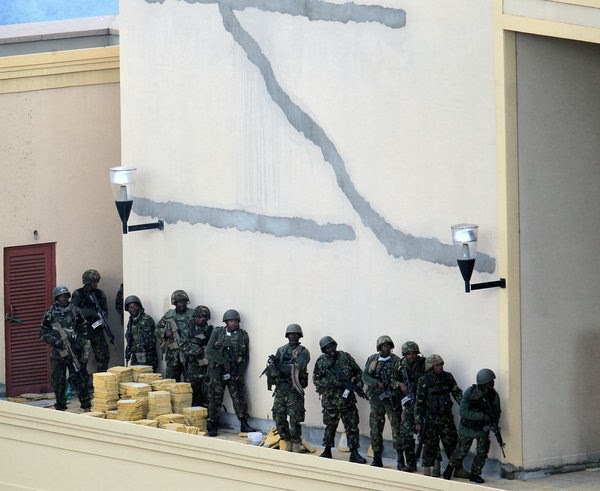 Western security officials also fear that several of the assailants dropped their guns and slipped out of the mall with the fleeing civilians and remain on the loose. Even the death toll may rise sharply. The Kenya Red Cross said Tuesday that more than 50 people were still missing. Mr. Kenyatta said that forensic experts would examine the corpses of the assailants to determine their identities, softening earlier assertions by Kenya’s foreign minister that Americans and a Briton were involved in the siege. He said that three floors of the mall had collapsed and that there were several bodies still trapped underneath the rubble, including those of terrorists. intermittently on Tuesday morning, and smoke continued to pour out of the mall, seeming to contradict earlier accounts by Kenyan officials, issued late on Monday, that the crisis was nearing an end. The exchanges on the ground were mirrored in a parallel clash of Twitter feeds, with the government and the militants advancing their conflicting versions of what was happening within the sealed-off confines of the mall. 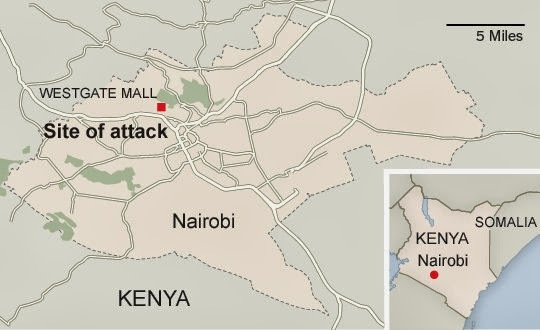 “We’re in control of Westgate,” Kenya’s Interior Ministry said in a Twitter message late Monday, referring to the large mall — an emblem of modernity and prosperity frequented by middle-class Kenyans and foreigners — thatIslamist militants stormed on Saturday. Throughout the four-day siege, Kenyan forces struggled to vanquish the attackers, who, after killing shoppers, holed up in various corners of the Westgate mall with military-grade weaponry. Hundreds of elite Kenyan troops — backed by armored personnel carriers, helicopters, planes and security officials from Britain, France, Israel and the United States — were deployed, but the militants refused to surrender. Kenyan officials have repeatedly tried to reassure the country — and the world — that they are bringing the crisis under control, mindful of the damage to the nation’s image as a cornerstone of stability in an often turbulent region. “This will end tonight,” Kenyan officials declared as a major rescue operation got under way on Sunday evening. But shortly thereafter, three Kenyan commandos were shot and killed at close range and several hostages were killed as Kenyan forces tried to move in on militants hiding in a dark corner of the mall, Western officials said. Kenya is a crucial American partner, its security forces working closely with their Western counterparts to contain Islamist militants in the region. Now Kenya’s capital, considered an oasis of prosperity in this part of Africa and an important base for Western embassies and businesses, has become a battleground in the conflict, and there is growing concern that this attack will not be the last.